The University of Wyoming graduation is just two days away and summer is just around the corner. If you are headed out of town for the end of school year or for any occasion this summer, consider taking Green Ride Colorado to and from the Denver International Airport. You won’t have to worry about parking and you can feel good about the service you are using because they try to be as environmentally friendly as possible. 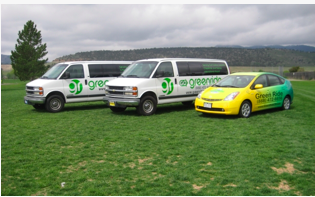 Green Ride Colorado services the Laramie and Cheyenne area and several parts of Colorado. According to their website, “Green Ride offers private charter service and can accommodate up to three groups of 30 people at a time with services between Wyoming and Colorado and between DIA and Fort Collins.” A full schedule of their times and pricing can be found here, but a single adult fare with pick up from either UW or the Hilton in Laramie costs $75 for a one way trip. Not only is Green Ride an easy solution to traveling to the airport, but they are also a company that believes in bettering the environment. By providing group transportation they are taking a least one car off the road that could have otherwise put harmful admissions into air. Not only do they drive with GREEN in mind, but their entire business is built on green ideas. According to their website, “Our reservation agents work from home; no driving to and from work; no big office to heat and cool. Office furnishing are all used goods acquired from: Colorado Corrections, Savers, etc. Paint from Larimer County Landfill, building materials from ReSource. The managers and officers don’t have individual offices. They work from home, from coffee shops, from wherever they are using computers and smart phones. We attract people who care about the environment. Many employees ride bikes to work and to meetings. Wish we could use a pedicab for airport service!” Green Ride Colorado also partners with companies who are also striving to better the environment. These include: Climatewise, Clean Cities, Redirect Guide, Be Local, GenGreen. You can go online to find out more about this LCBA member who is trying to make a real difference in the community. You can also make a reservation online, or call for same day reservations: (970) 226-5533. Just remember that you must call for reservation requests after 5pm the day before travel. Next time you need a ride to DIA consider Green Ride Colorado! GO GREEN!